"Since the first day I got here, I received great treatment from everyone both inside and outside the club, and I really felt welcome both in the city of Aalborg and at the club," Bassogog was quoted as saying by the AaB website. "Now I've got an offer I could not refuse, and I look forward to new and exciting experiences in China. I want to thank my team-mates, coaches and the nice people in administration during our time together. "I must say a big special thanks to the supporters and not least my foster family - they all played a big role in the man I am today," added the midfielder. BBC Sport understands that Henan Jianye signed the player for $8.7 million in what AaB club director Allan Gaarde - who praised the players' dribbling, pace and physique - described as a remarkable rise. 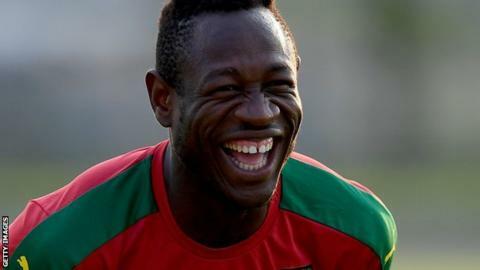 Prior to joining AaB in 2015, Bassogog had been playing in the third tier of football in the United States. "For Christian and AaB, it's been a great story since he came on trial with us only one and a half years ago," Allan Gaarde said. "No one could have imagined his rapid development. Beyond his on-field skills, Christian is a happy, well-liked person and we wish him all the best in China and every success in the future." Bassogog started all six games at this year's Nations Cup, scoring in the semi-final as the Indomitable Lions beat Ghana 2-0. His performance for the North Carolina-based side, who will receive a slice of the transfer fee paid by Henan Jianye, earned him a trial at AaB and he was duly rewarded with a four-year contract in August 2015.